Quinoa (pronounced KEEN-wah) is my favorite side dish and a perfect alternative to rice. It's full of fiber and protein but the texture, the gentle "pop" when you take a bite, that's the fun of this dish. Dress it up with broth, juice or any number of flavors that will enhance its inherent nuttiness. 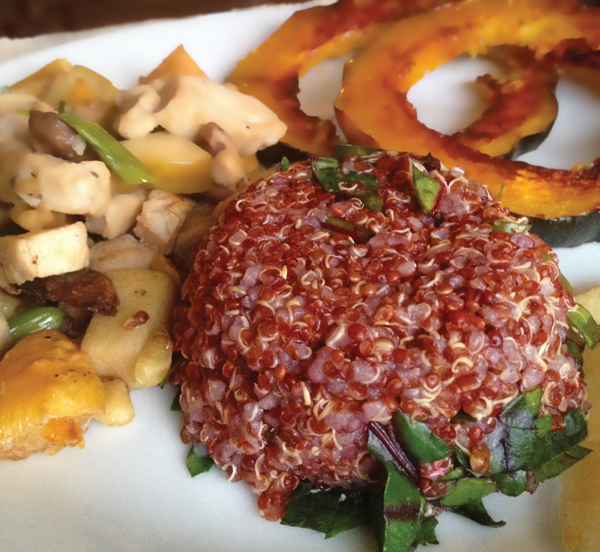 In this version, I cooked the quinoa in apple juice to compliment the curried chicken and glazed squash I served. Since I used a glass cup as a mold I kept it simple with few additions. If you're not using a mold, you can add walnuts and diced apples. This one is as versatile as they get! This one is so fresh and easy that you'll want to make it all season! 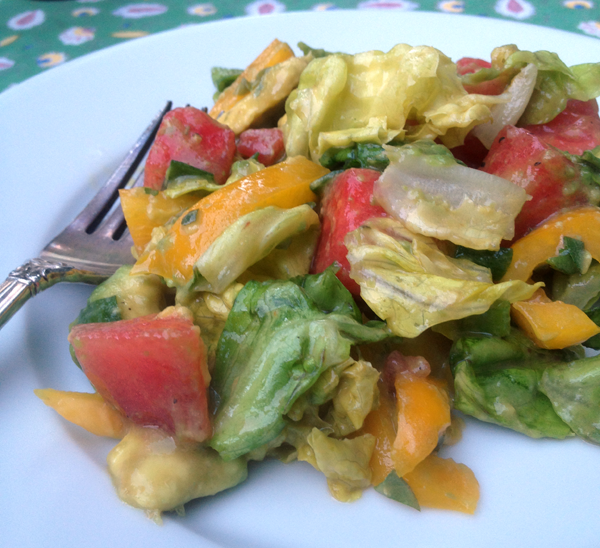 The watermelons are juicy and flavorful; the perfect compliment to citrus and avocados. All the ingredients can be sourced locally right now, so enjoy this season's bounty! Serve this with grilled beef or ribs. It's just fresh enough to give your palate a rest and it's great fun. I know a few people who don't care for tomatoes so I decided to substitute those with watermelon. It's unexpected and I think you'll like it. Feel free to make this ahead, just keep it cold until about an hour before serving. I keep the diced avocados in the lime juice and pour that over the top as a dressing. I've been waiting all year to make these! The figs are finally here and I've got some of my new local find - goat cheese (chèvre) from Fraga Farms. This recipe is both savory and sweet. The tangy goat cheese and a dash of black pepper go well with the sweet honey and aromatic lavender. The lavender is very subtle. If you want more of that taste you can grind the lavender buds and use them as you would a spice. In fact, I might try that next time. I made puff pastry for this recipe and it was good (the recipe link is below) but I think it would be fine with frozen pastry dough. This is really all about the filling. Make it as easy as you'd like. The thing about this pastry is that it's so pretty. It's really nice for a brunch or a leisurely weekend breakfast. They will last a few days - just remember to refrigerate them in the hot weather. I love Summertime! Like that old song says, the livin' is easy. Entertaining is casual and serving small bites, made with the freshest ingredients, is exactly what I love to do. These are such versatile appetizers that you can make one batch and that appeals to three different palates. Okay, three different - spicy loving - palates. I decided to experiment with a few different fillings this time. The first is a light version with cream cheese and Greek yogurt dipped in egg and panko crumbs. The second, a more traditional version, is filled with cream cheese, and topped with grated cheddar. The last, I call them Heavy J's, are filled with cream cheese and cheddar then wrapped in bacon. When I made these, I wanted a variety so I divided the ingredients and prepared them all at once. If you have a preference the recipe is easily multiplied (or divided) to meet your tastes and needs. A few tips: Gloves. Use them. Jalapeño oil is a slow burn that will last under your fingernails for days. If you forget, use dish detergent (like Dawn soap) and COLD water to dissolve and remove the oils. Another tip, let them rest when they come out of the oven. They really are molten. Give them at least 5 minutes to cool and to let the cheese set.